• Andrea Iannone performs well in opening race of the season. • Unfortunate DNF for Alex Rins after strong start. • Team SUZUKI ECSTAR still look ahead with positivity. 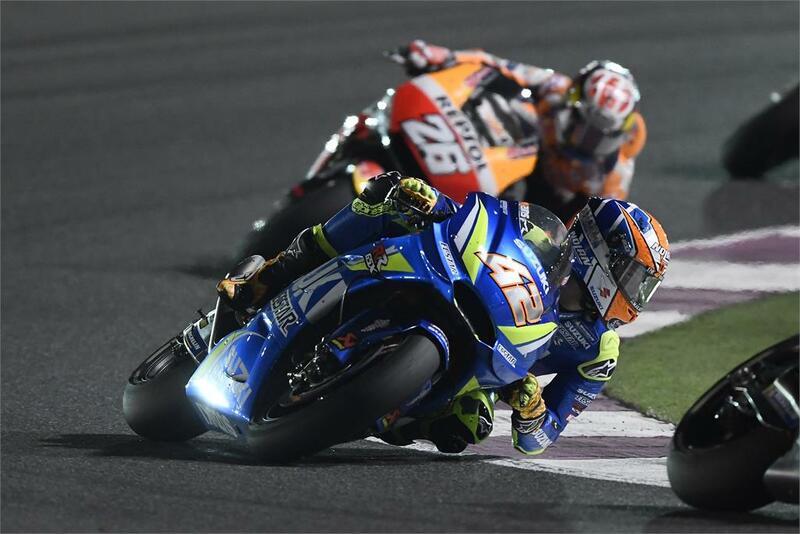 The first race of the 2018 MotoGP calendar took place in hot and windy conditions under Qatar’s famous night lights. Andrea Iannone and Alex Rins took to the start with confidence after a positive morning Warm-Up in which they took 5th and 10th respectively. Although Alex Rins suffered a small crash during this session, there were luckily no consequences. Choosing the medium front and soft rear combination, the riders took the grid and attacked early on as the lights went out. Andrea Iannone managed a great start from his 11th place grid position and he was able to slot in ahead of many competitors. He kept in touch with this lead group for the first half of the race despite struggling with front end feel, and he picked up a few places as the laps ticked by. Andrea hovered consistently between 8th and 10th for the duration of the race and despite a late charge from some of his rivals he held on to 9th place over the finish line. Alex Rins managed to set two fastest laps (a 1:55.675 on Lap 3, and a 1:55.331 on Lap 6) during his time in the leading pack, and was running a very high pace, responding to over-taking manoeuvres quickly, matching the pace at the front, and keeping himself in contention for at least a Top 5 finish. However, with 10 laps to go, Alex drifted wide in the second corner and found the dirty part of the track, he lost the front and unfortunately crashed out of the race. Despite this, the young Spaniard felt he learned a lot and enjoyed the feelings.